Welcome back ! Hopefully we are now back into a routine of publishing a fresh blog every week. 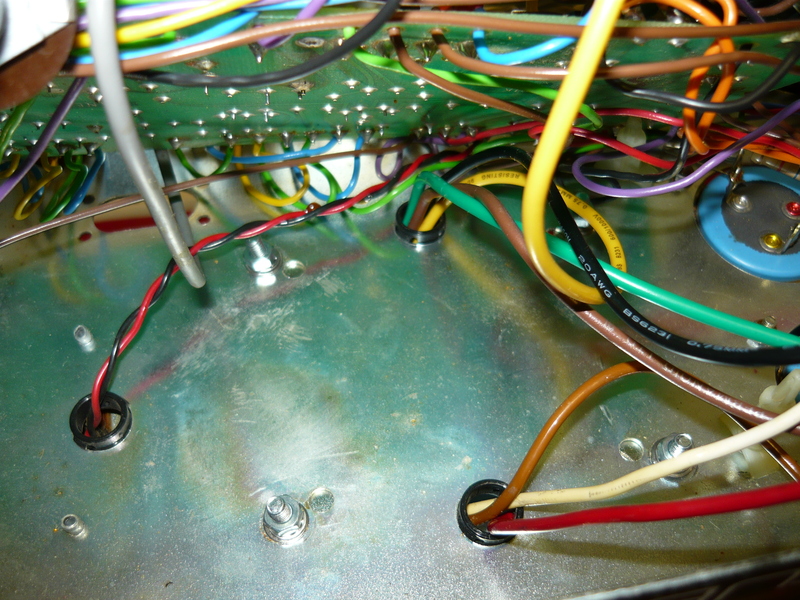 In this week’s blog, we discuss a major upgrade project recently completed for the (Fender) ’65 Deluxe Reverb Reissue, which we will refer to as the DRRI. The guitarist in one of Sydney’s best loved and longest surviving blues bands has been playing through a Twin Reverb for decades, but decided to downsize to a lighter amp for the smaller rooms, which makes complete sense, and invested in a new (2015) DRRI. As you can see from the photos, this particular Limited Edition DRRI looks very smart indeed, with the early ’60s Brownface amps cosmetics. Also included in the Limited Edition package was a Jensen (new production) speaker. 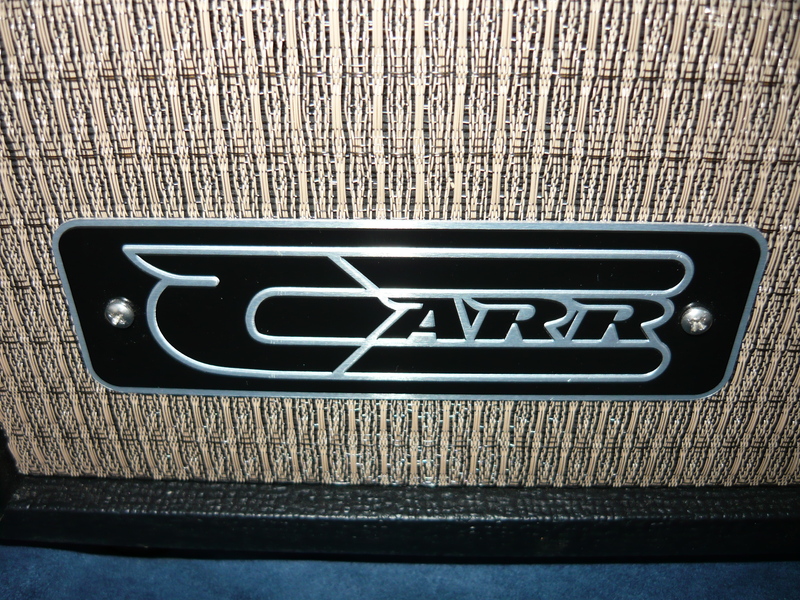 All other aspects of this amp were identical to the standard edition DRRI. 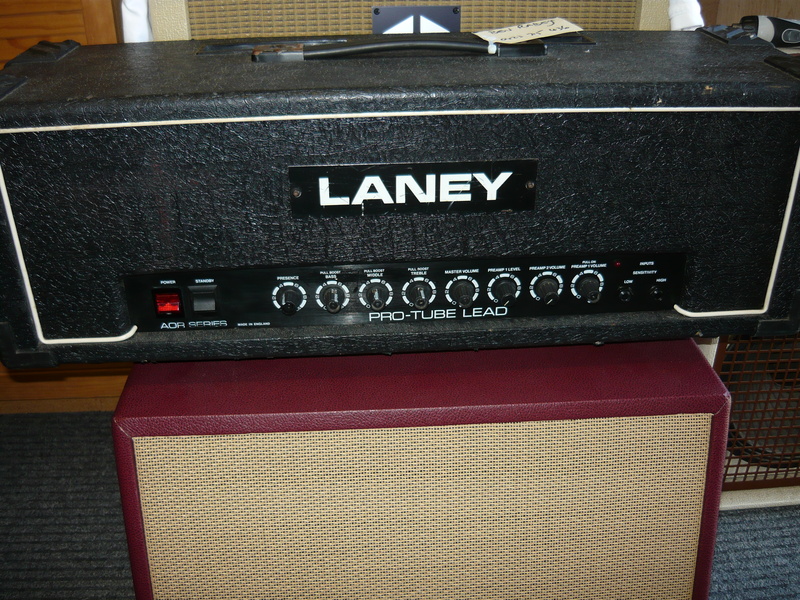 Unfortunately, the tonality presented by this amp was very thin and rather shrill. Overdrive characteristics when the amp was turned up (no pedals) were actually pretty awful. We attribute a lot of this to the choice of speaker. Just as critically for our customer, the lack of headroom with this amp and speaker combination defeated the whole purpose of investing in this particular amp, as it was virtually unuseable even for the smaller gigs. The first step in this project was to upgrade the speaker, as is so often the case with combo amps. Choosing a speaker is not as easy as it sounds – there are a bewildering number of specialist guitar speaker options out there now. WGS offer some excellent choices at very reasonable prices, and we ended up choosing the G12C from their American Vintage range. We could just as easily have chosen the G12C/S for a smoother, softer top-end, but this model does seem to complement the DRRI voicing and adds a couple of dB in efficiency which will help with the headroom problem. Most importantly, the G12C fills out the missing lows and mids of the DRRI and behaves itself very well under overdrive conditions. The 75 watt rating of this speaker allows a healthy overload margin. 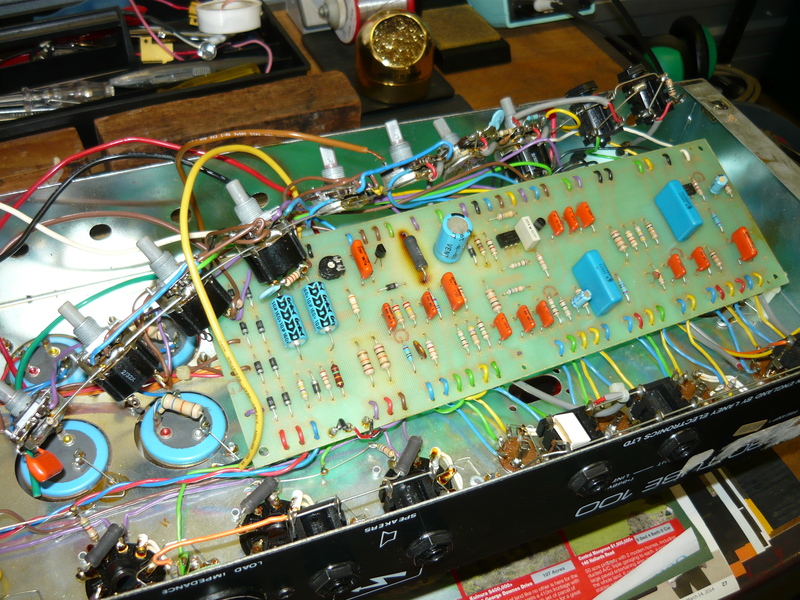 Having restored the basic tonality of the amp with our new speaker, in consultation with the customer we devised a major upgrade project to increase the headroom available by implementing a conversion from the existing 6V6GT output valves to the larger 6L6GC output valves. To take full advantage of the larger valves we also replaced the existing transformer set. 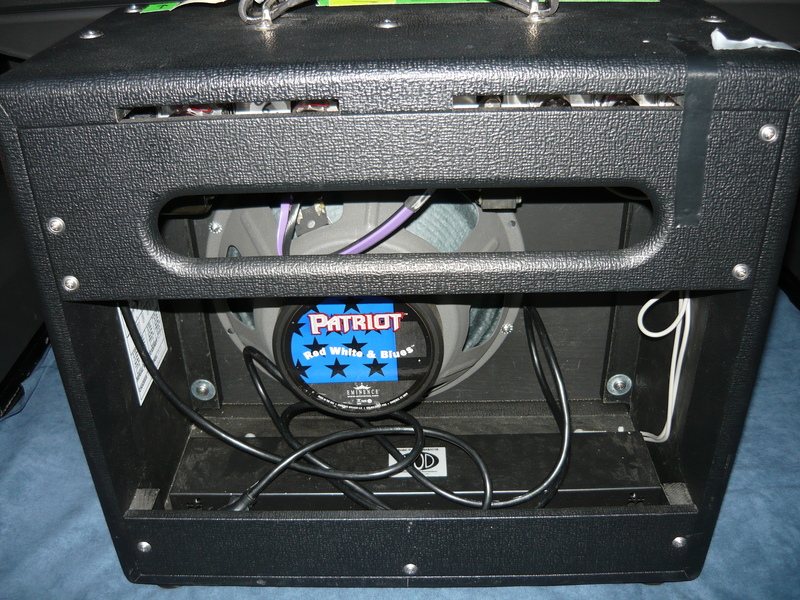 The available space and the need to allow clearance for the 12-inch speaker restricts our choices somewhat, but by re-orientating the output transformer and choke just slightly, we could install the power transformer, filter choke and output transformer set as per the 60’s Vibrolux/Tremolux series 6L6 amps. Such a reproduction transformer set was available at very reasonable pricing from Magnetic Components of Chicago, USA, although the cost of shipping adds quite a bit these days. Such an upgrade will increase the power output of the amp to between 30 and 40 watts, as per the original amps of the abovementioned series, without a huge increase in the weight of the DRRI. 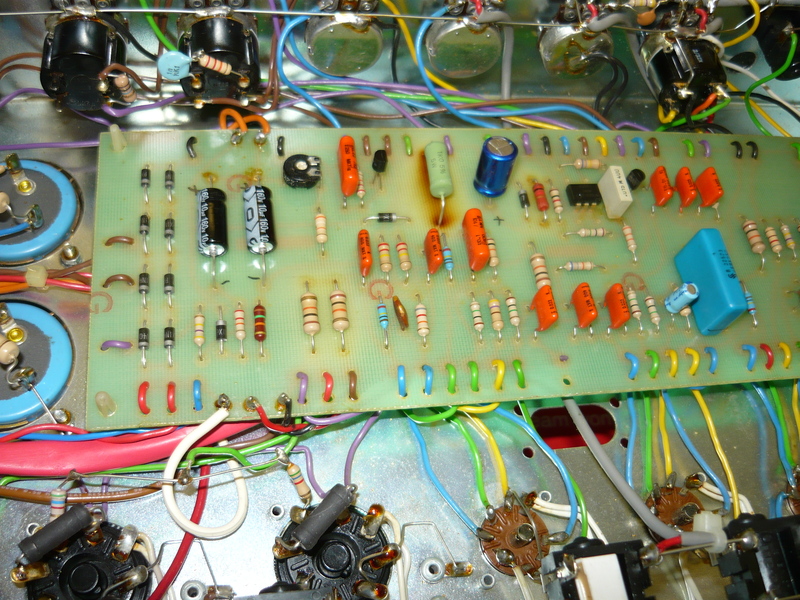 It will be necessary to modify the bias circuitry slightly (one resistor) to increase the range of the bias adjustment to accomodate the 6L6 output valves. 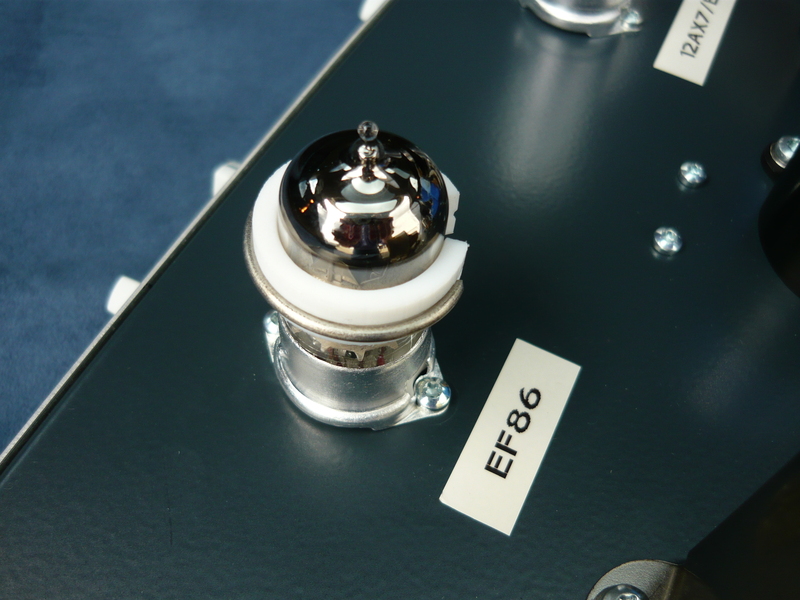 We also upgraded the main high-voltage filter capacitor to the good quality F&T brand. This was not an inexpensive project by any stretch of the imagination, but much, much cheaper than selling the amp on and reinvesting in a more suitable amp. 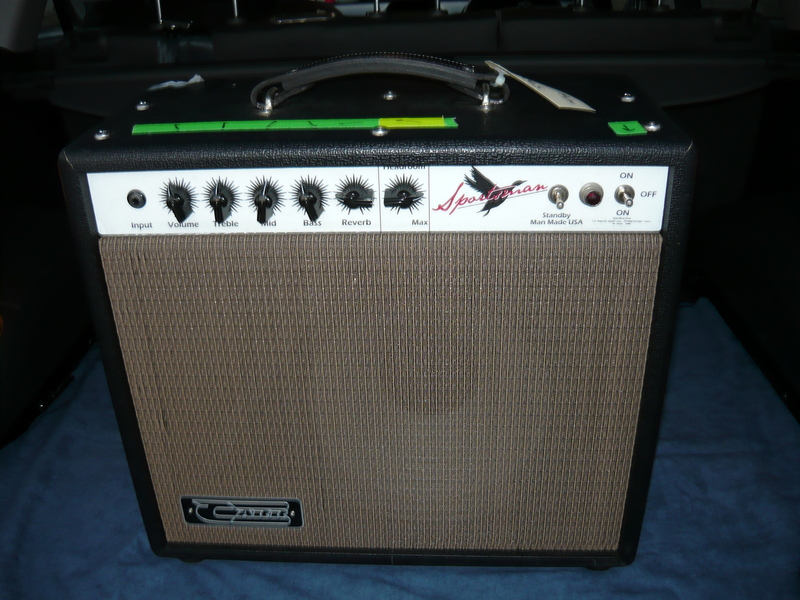 We have replaced the shrill and brittle tonality, as presented by this example, with a very warm, full sound, still characteristic of the best examples of the Fender Deluxe Reverb, and increased the headroom significantly. 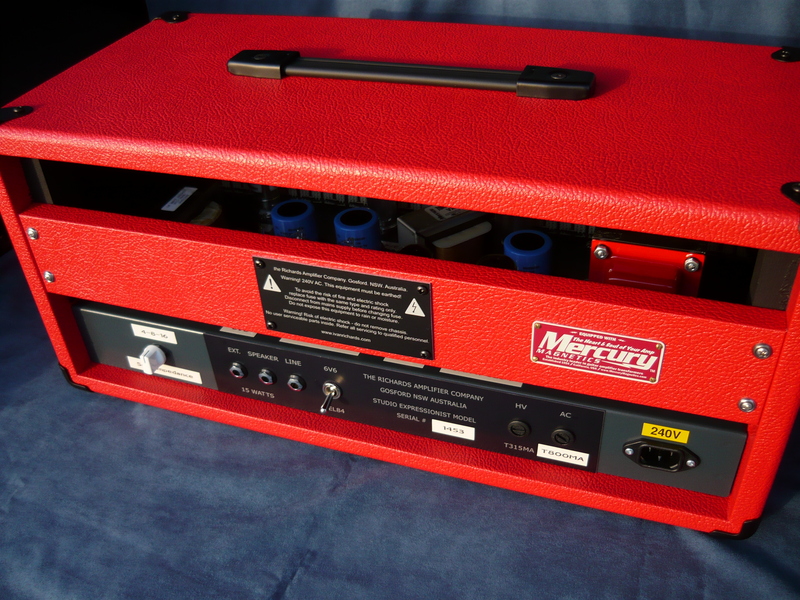 This is now a fine performance amplifier which will serve our customer well ! Welcome back to the blog, everyone. We have been servicing the Peavey Classic Series 30 watt and 50 watt combo’s since their introduction back in the 1990’s and we are in fact still the A.M.I. 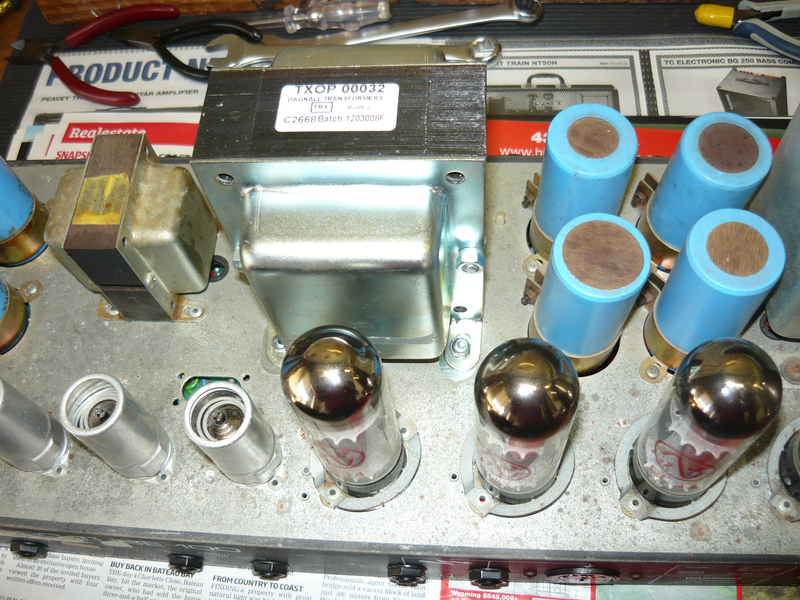 authorised Peavey warranty repairer (valve/tube amps only) for NSW. Since the 1990’s the 30 watt 1×12 combo has overtaken the 50 watt models in terms of popularity as they provide reasonable performance in a compact package. Reliability has been questionable at times – we have had to repair printed circuit boards (PCB’s), replace transformers, valves and 9-pin valve sockets, and so on. 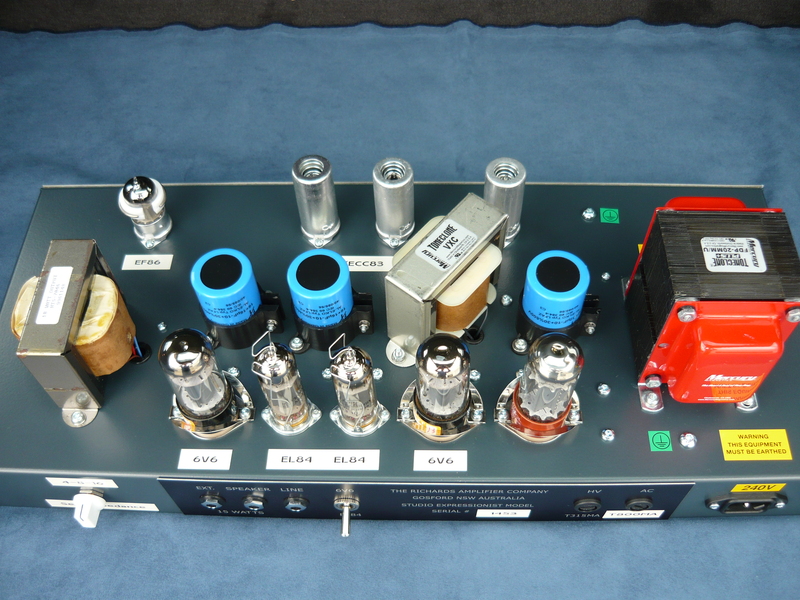 Bias for the EL84 output valves is non-adjustable, which means some amps run rather hot. 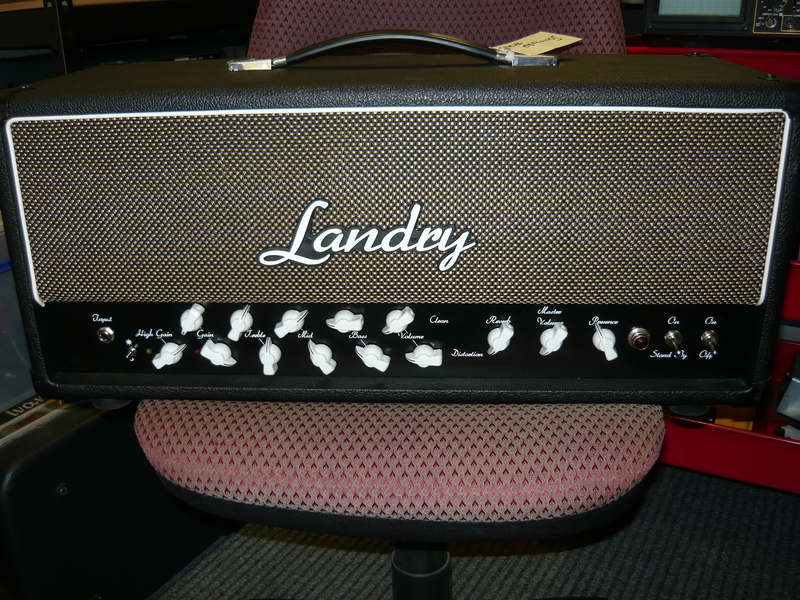 The subject of this blog is a more recent 2×12 model delivered to us by a local music shop, reported as losing output and nil reverb level. 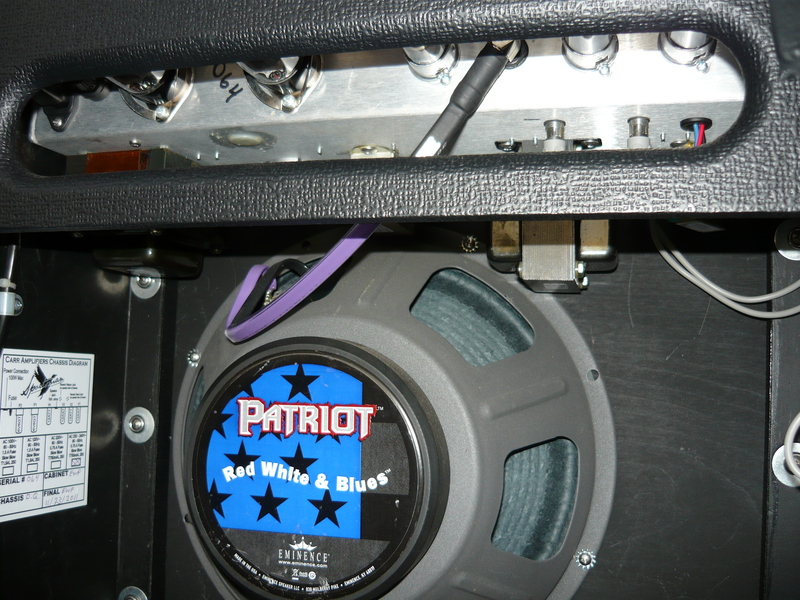 It may not be immediately obvious from the photo, but the speaker connection tagstrip, normally pop-riveted to the speaker basket, has come adrift, causing unreliable operation. This is a problem we have witnessed many times with the cheaper OEM speakers supplied by Eminence of the USA to various amp manufacturers. The only reliable solution is to carefully drill out the remaining body of the pop-rivet and refasten the tagstrip by other means. In the meantime we isolated the ‘nil reverb’ problem to the reverb tank itself, which is mounted in a vinyl bag at the bottom of the cab. The only way to gain unrestricted access to both the problem speaker and the non-functional reverb tank is to remove the speaker baffle completely from the cab. This is what is known as a ‘floating baffle’, with mounting screws along the top and bottom front of the cab, which must be removed. The amp chassis has to be removed before this can happen, of course. Once the baffle is removed and placed face down on the workbench, we can repair the speaker. We choose to refasten the tagstrip with nut/bolt/lockwasher rather than another pop-rivet. It takes longer but will survive the demands of rock’n’roll guitar. The other speaker on this 2×12 baffle is checked OK.
Before we re-install the baffle into the cab, we will repair the reverb tank. One of the transducers tests open-circuit (O/C) and is not repairable, so we will replace the unit altogether. This is not a bad thing as we will upgrade the reverb with one of the ‘MOD’ tanks, The reverb will sound much better than it did previously. 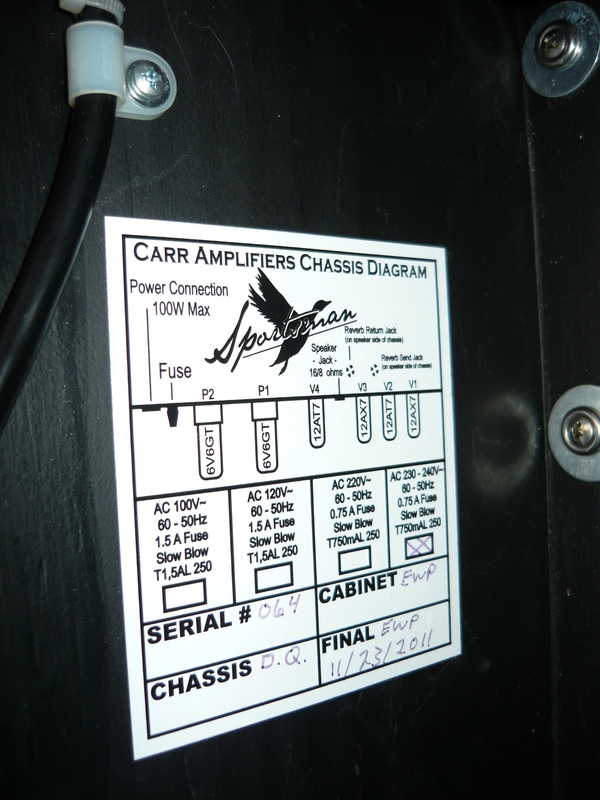 Reverb tanks are available in various combinations of impedances and delay times, so it is important to select the correct unit for the individual amp. 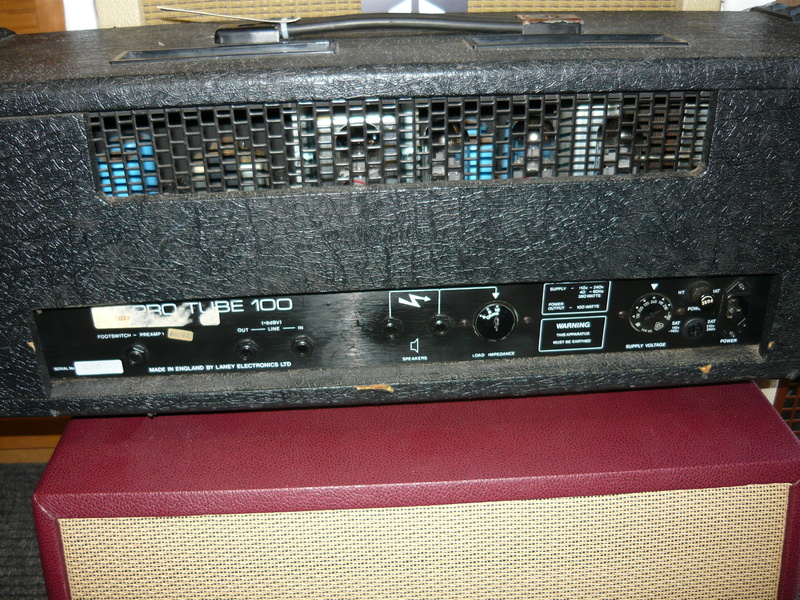 In the Peavey Classic Series, the reverb tank is driven by an IC, requiring a different input impedance than for example a Fender ‘Deluxe Reverb’. The replacement tank is placed within the vinyl bag, which provides some degree of isolation from vibration, which in turn is screwed into the bottom of the cab. 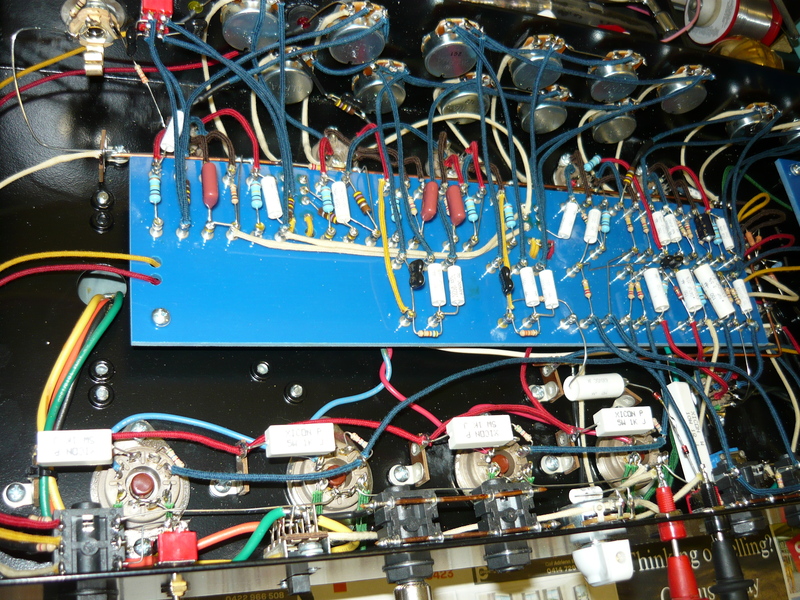 The baffle and amp chassis are each reinstalled into the cab, and the reverb cable reconnected within the amp. We had previously tested all the valves (tubes), external to the amp, and also carried out a power output test and electrical safety test. The final play test revealed a huge improvement, and the amp was returned to the music shop. 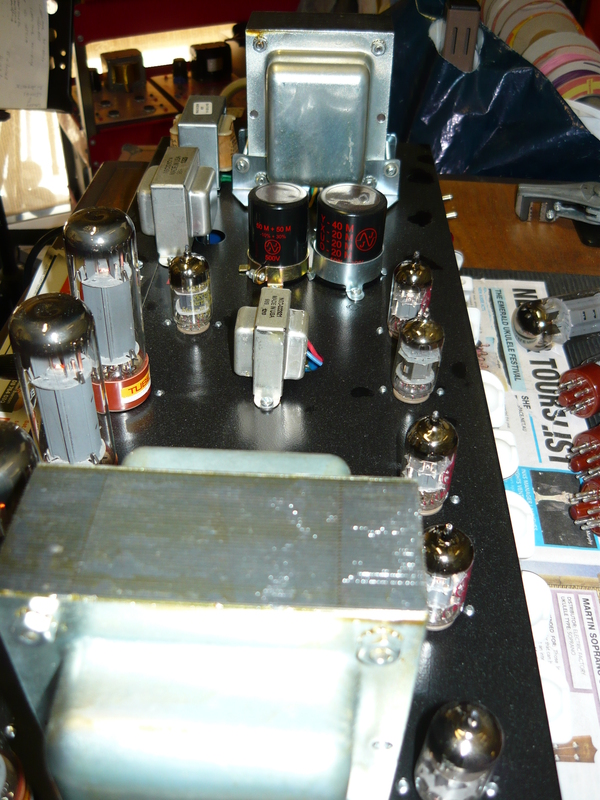 Thanks for checking out the blog and we are located here in Gosford (Wyoming) NSW for all your valve (tube) amp service needs, including custom design. IR. Welcome back to the blog after a long break of 3 months. 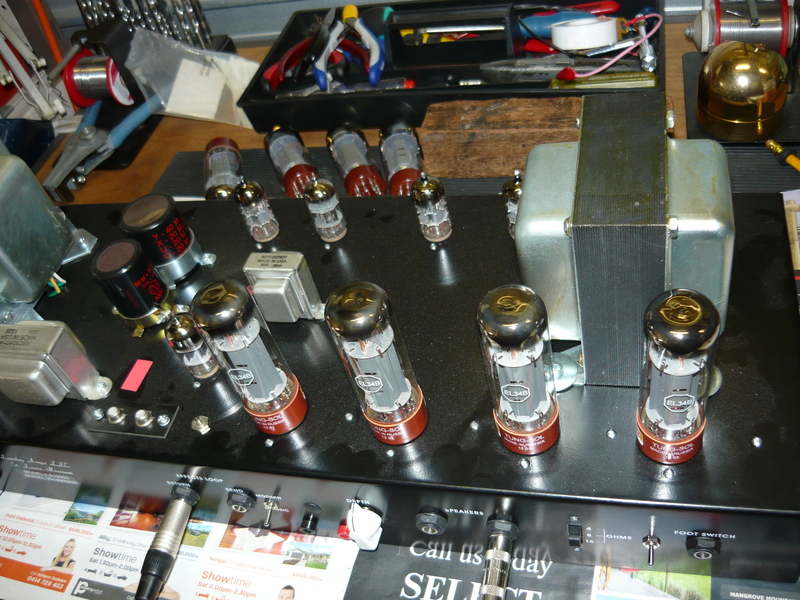 We have been busy !Here is another in our occasional series of blogs where we publish a visual report of a custom-order amp build, in progress. 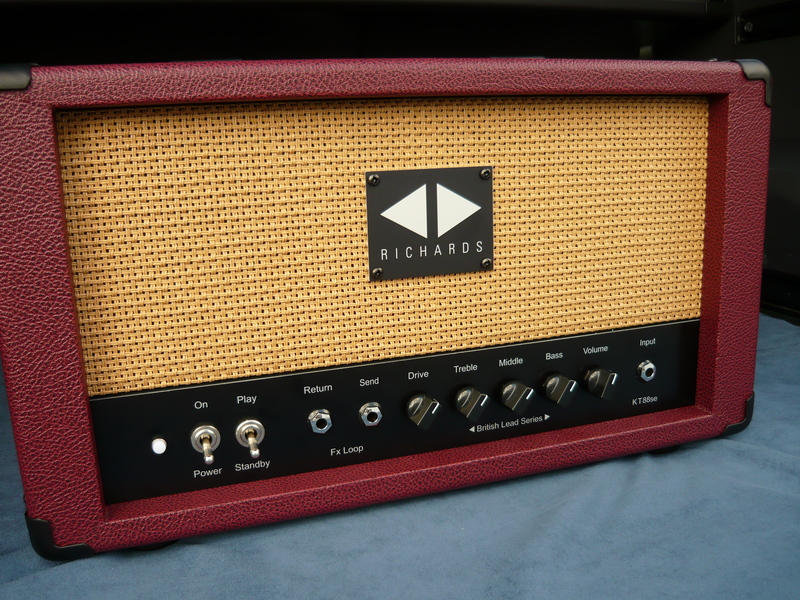 This example shows a Richards Amplifier Company British Lead Series chassis underway for our good customer Greg, of Sydney. 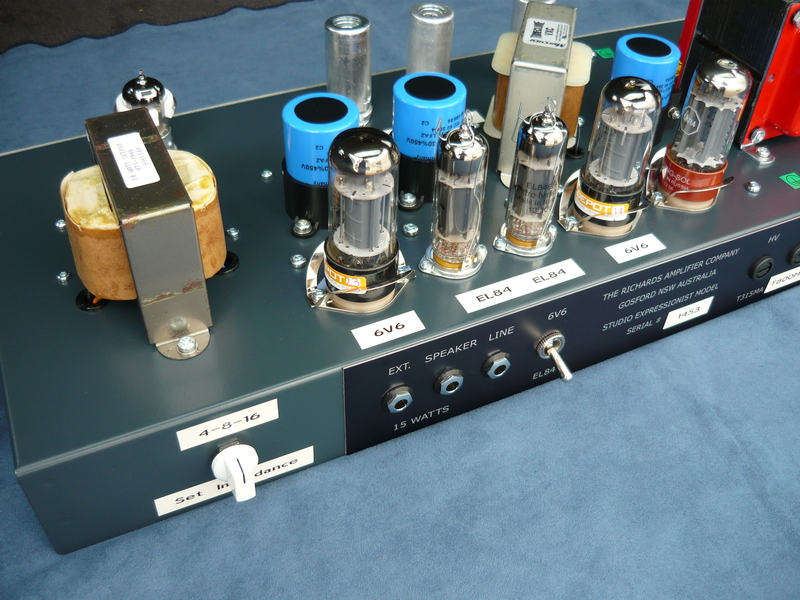 Greg has previously purchased our Expressionist and Blue Mood model amps, with matching Tone Cabinets. Greg has developed an appetite for vintage ‘British’ tones, but with the output scaled down to a more manageable 18 watts at full power, by employing a pair of 6V6GT output valves (tubes), in lieu of the more obvious choices, such as EL34’s, KT66’s or KT88’s. 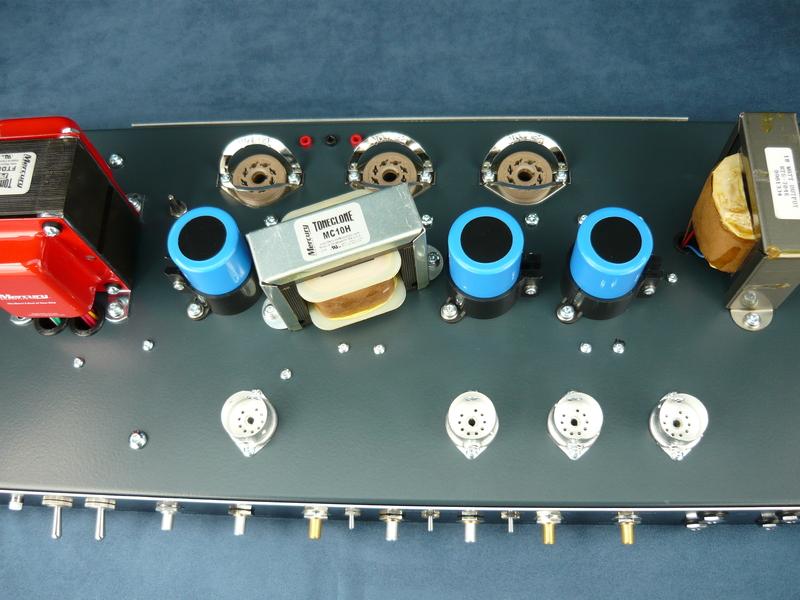 Rectification of the high voltage supply on this model is handled by a GZ34/5AR4 valve (tube), with excellent current production valves now also available from Tung Sol and Mullard. With this project, we are looking to create the broadest range of classic, vintage British tones possible – including those tones recorded by (for example) artists as stylistically diverse as Mark Knopfler (JTM45) or ZZ Top’s Billy Gibbons (JTM45/Plexi/JMP). To that end, we have included a trio of mini toggle switches on the front control panel to reconfigure both the ‘front end’ circuitry and the 3-band passive EQ as required to achieve ‘JTM45’, ‘Plexi’ or ‘Metalface’ voicings. The 2nd mini toggle switch actually switches an additional 12AX7 valve (tube) into the signal path to achieve the more aggressive ‘JMP’ or ‘JCM800’ voicing and gain structure. The control panel starts on the right hand side with the traditional 4 inputs, arranged as a pair of inputs for each preamp channel – ‘Brilliant’ and ‘Normal’. 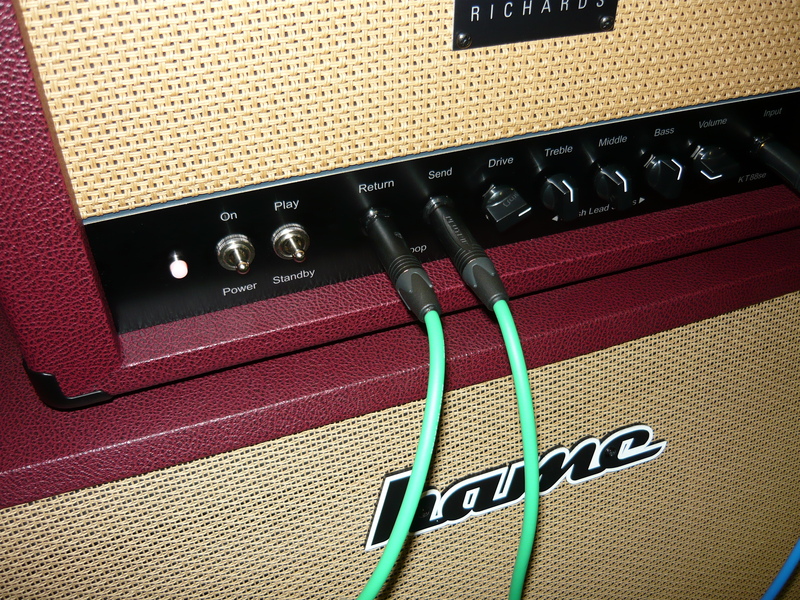 The preferred method of operation is to plug into the 1st channel, then use a short, high-quality jack-jack patch lead to cross connect to the 2nd channel. The ‘Brilliant’ and ‘Normal’ channels are now connected in parallel. 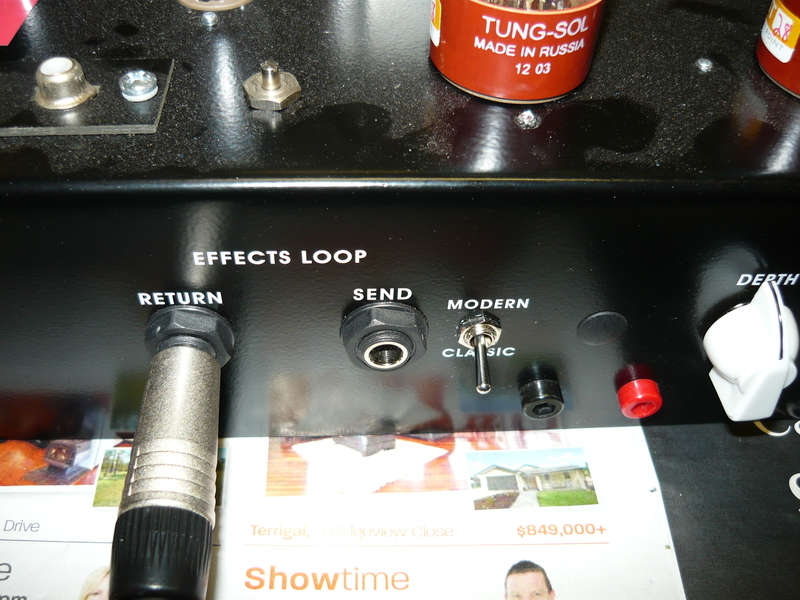 The player then sets the desired balance between the two tonalities with the preamp volume controls. This is probably best done with the EQ set fairly flat (ie, 12 o’clock), then having balanced the volume controls – fine tune the amp’s voicing using 3-band passive EQ and the ‘active’ presence control. A mini toggle switch configures the 3-band passive EQ as per the early ‘blues’ JTM45 voicing, or the later (post 1968) ‘crunch’ voicing. The presence control functions as part of the power amplifier circuitry and adds emphasis to the upper-midrange and high frequencies. A good starting point is to set this control to the 12 o’clock position, then fine tune from there according to the acoustics of your playing environment. You could consider the balancing of the two channels as your ‘primary’ equalisation, and the tuning of the 3-band treble/middle/bass controls as your ‘secondary’ equalisation. 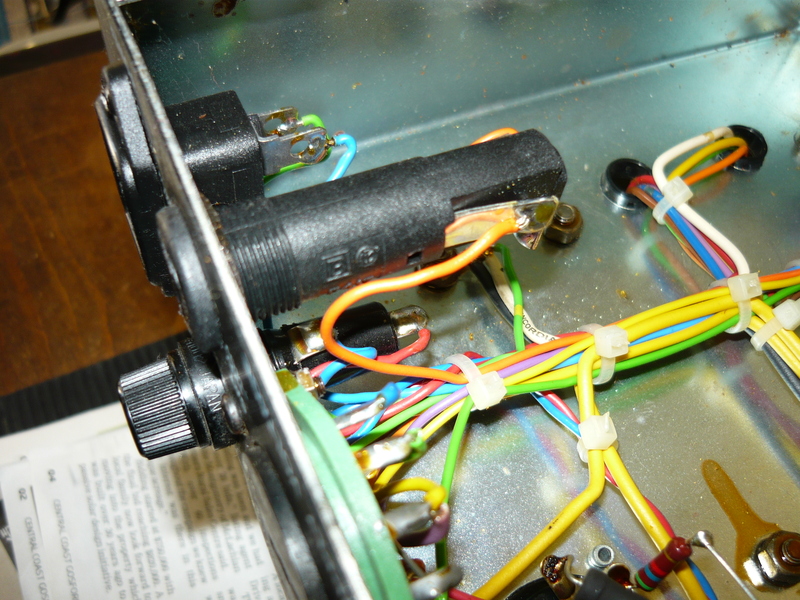 Then the presence control adds further brilliance as required – in effect the amplifier’s ‘final’ equalisation. 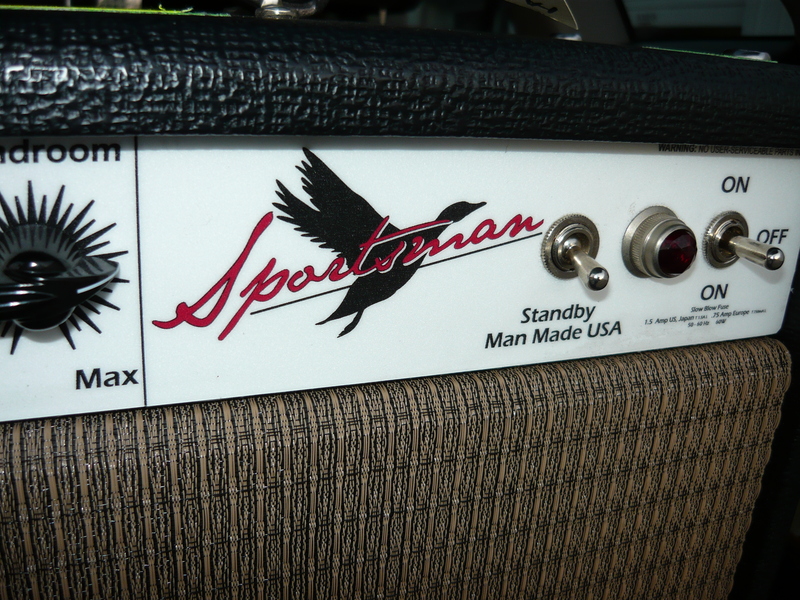 We think that a master volume control is absolutely essential on an amp like this, even though it was not provided on the original amps that inspired us all. 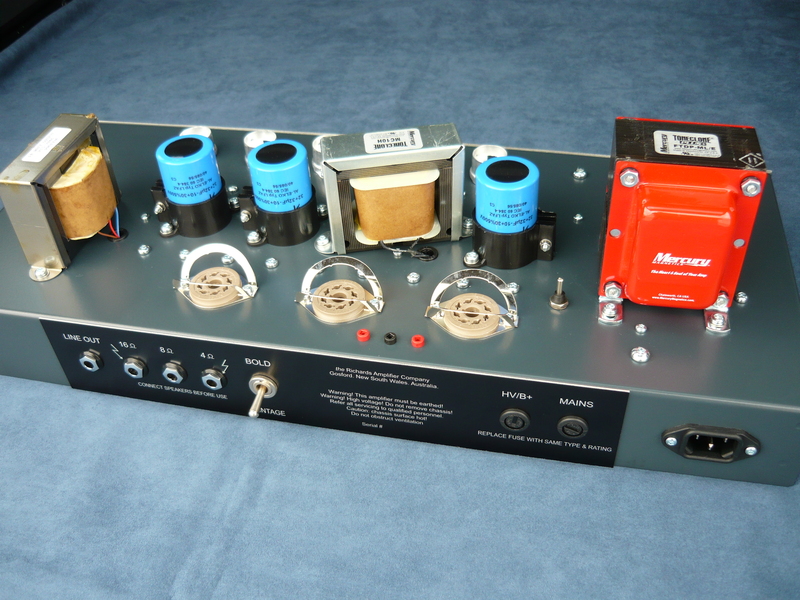 Once you have found your ‘sweet spot’, mixing the preamp volumes and refining the EQ and voicing options available on this amp (as discussed in the paragraphs above), there is a reasonable chance that you will be playing at a volume that is considered excessive under the prevailing circumstances, hence the inclusion of our master volume to keep it all under control. The guitarist who prefers to play with the amp running wide open will appreciate the transparency of our master volume design when set to maximum clockwise rotation. The master volume (MV) control actually functions as part of the power amplifer circuitry – ie, it is located post phase-inverter stage (PPI) in the signal path. The primary function is to manage the output levels as required, but when used specifically to generate distortion, its location means that every preamp valve (tube), including the 12AX7/ECC83 phase-inverter stage, is contributing to the end result. There are other benefits to this design approach as well. With the MV set to maximum clockwise, the amp (up to the point of power amp clipping) is delivering its cleanest, brightest and tightest tones. On the other hand, as the MV is rotated anti-clockwise, the effect of the global negative feedback loop is progressively minimised, and the amp loosens up and behaves much more like a vintage amp design, with a sound full of fat, warm ‘valvey’ character. The remaining front panel controls include high-quality metal toggle switches for power on/off and standby/play functions, plus a power-on indicator. The rear panel controls/functions include mains and high voltage supply fuses, full-power/half-power switch (once again a high-quality metal toggle switch), output jacks for 16, 8 and 4 ohms, plus an earth-lifted output jack for line/recording, ie DI. 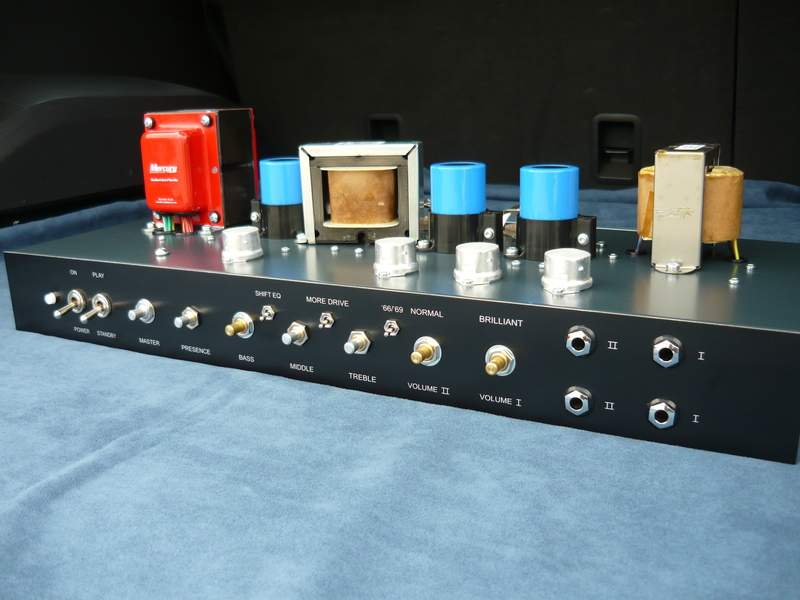 We will now be offering this amplifier model as a permanent fixture in our range of designs, with power output options of 18 watts (6V6’s), 30 watts (KT66’s), 40 watt club amp (EL34’s), 50 or 100 watts (EL34’s), 60 watts (KT88’s). 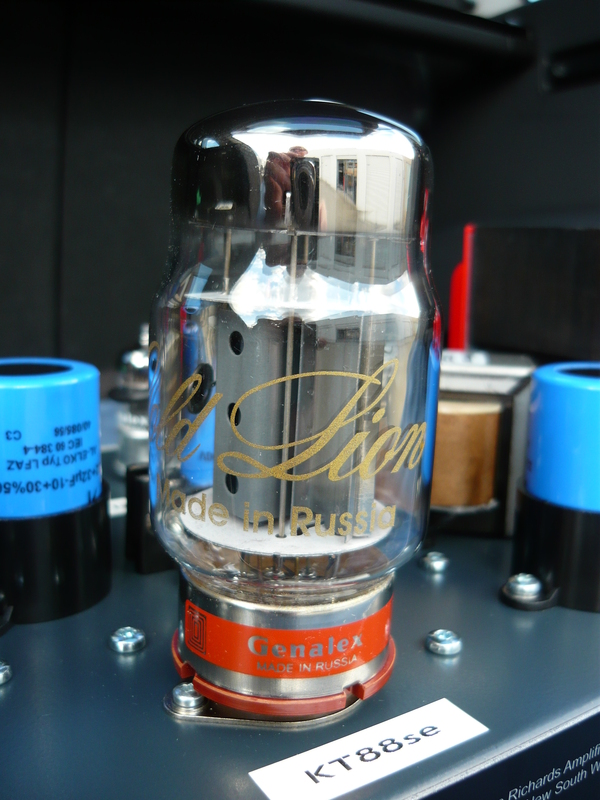 Thank you Greg, for your continued custom and enthusiasm for our amplifiers ! IR. 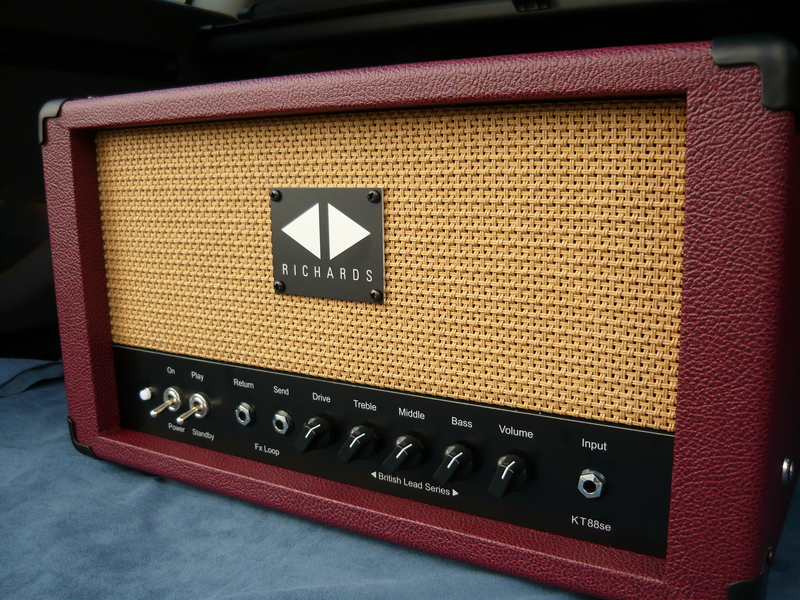 Here is a testimonial to the KT88se model amplifier, rated at 15 watts into 4, 8 or 16 ohms, designed and hand-wired, one at a time, by the Richards Amplifier Company – Australia. The testimonial was written by Chris Earle, Sydney based baritone guitar and open-tuning guitar stylist and is reproduced in it’s entirety without any editing. 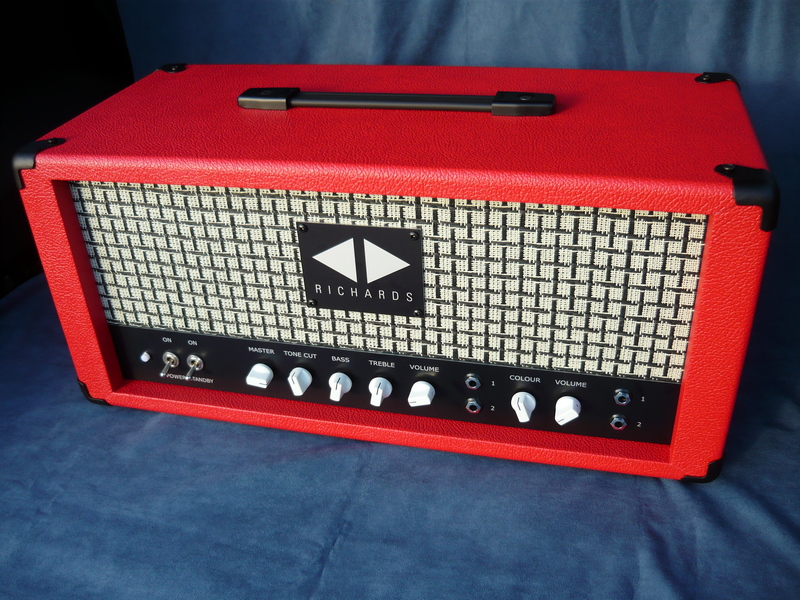 Chris commisioned the development of this unique design and ordered the first two amps to be completed. Please see our previous blog for an introduction to the KT88se and a detailed background to the development of this model. Many thanks to our good customer Chris for these words………. 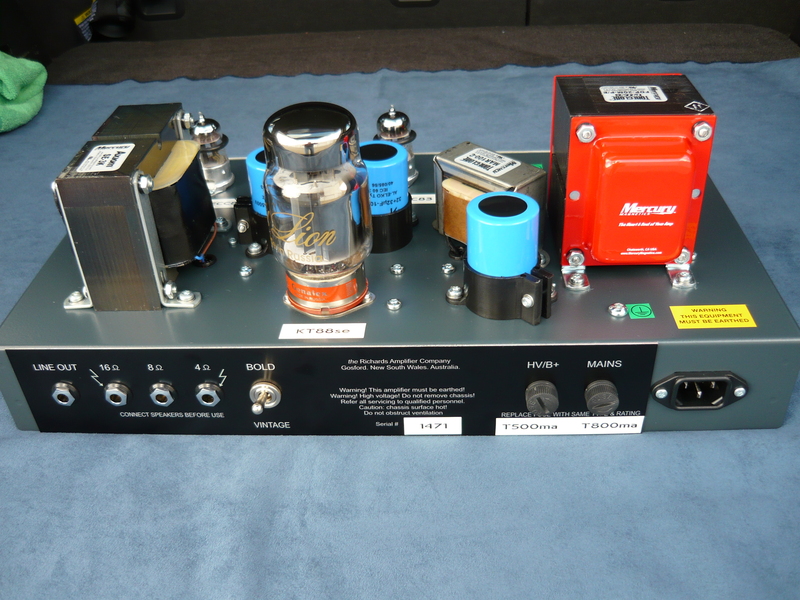 “This amplifier is unique and highly innovative – during my research I’ve not come across a dedicated KT88 single ended amplifier built to such a high specification – there may be some ‘home brew’ ones out there – but none with the same impeccable build quality, application of years of hard won intellectual property, and unquestionable tone. The oversize Mercury Magnetics transformers and choke certainly play their part – but it’s Ivan’s skill and insight with amplifier design that makes this the best amplifier I’ve heard or played by a country mile. It has a truly rich beautiful sound – the notes decay with a chunky well defined solidity that I’ve never heard before – the 2nd harmonic is sublime with this amp – it provides an extra depth that is unforgettable. 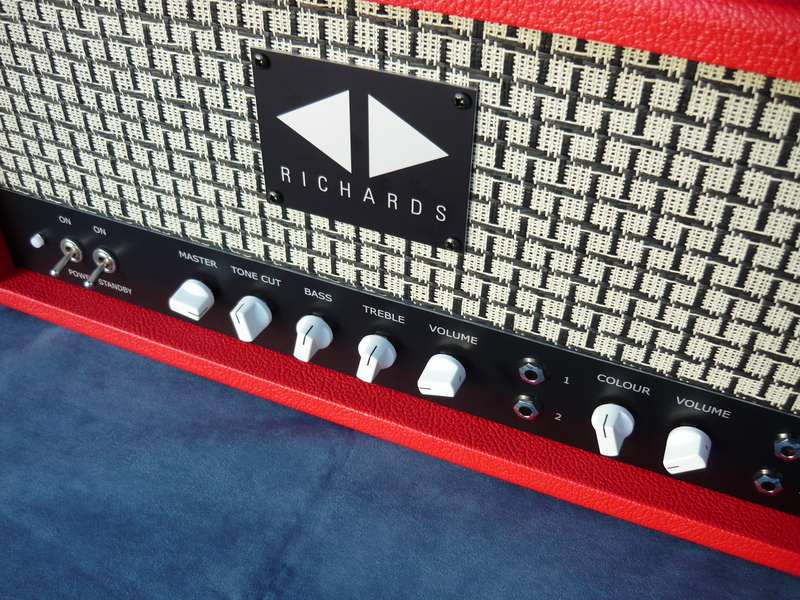 The use of a Richards modified Hiwatt style preamp is a master stroke by Ivan. It allows the clean signal to be uncluttered by any form of fizz or fuzz and translate every subtlety and nuance from the fretboard. This means it sounds amazing with modulation, be it Uni-Vibe, Chorus, Phaser or Flanger as well as long, full delay trails. But the piece de resistance is the driven sound – a richer, fuller sound is not humanly possible ! Yet it still retains astonishing clarity with my oversize guitars, be it open-tuned chords, slide or blazing single note runs and vibrato – no mean feat given the shortcomings of a single ended design that I’d experienced previously: lack of headroom and a compressed, cluttered sound. Ladies and gentlemen ! Let us proudly introduce you to our very first amplifier designed from the ground up to showcase the mighty KT88 power output valve. There are another two models in the early stages of design and construction, but the prototype KT88se is the first and has been in constant use by owner Christopher Earle since he took delivery Christmas 2013/2014. Chris is a baritone guitar and open-tuning guitar stylist from Sydney, Australia. He has been using the KT88se for creating, previewing and recording his repertoire. The KT88 valve, in the ideal circuit, is capable of creating the most awesomely robust guitar tones you can imagine. They were employed back in the day in a number of Australian and New Zealand built amplifiers, Wasp being the best known example – also in a number of higher powered British amps, famously including the Marshall Major. In the days of rack-mounted power amps and preamps, there was also a very fine sounding KT88 dual 100W power amp from Seymour Duncan. However, during the 80’s and 90’s things looked very bleak for the KT88 – it became impossible to source KT88’s of sufficiently high quality construction to hold up ‘on the road’ (as well as the fact that the original UK manufactured examples became impossibly expensive). All those Wasp amps, and Marshall Majors, were ‘retired’ from active duty. Thankfully, that situation has completely turned around in the last decade or so with a number of factories producing very good sounding KT88’s – Genalex/Gold Lion and Electro Harmonix are two brands we can recommend from personal experience in guitar amps. 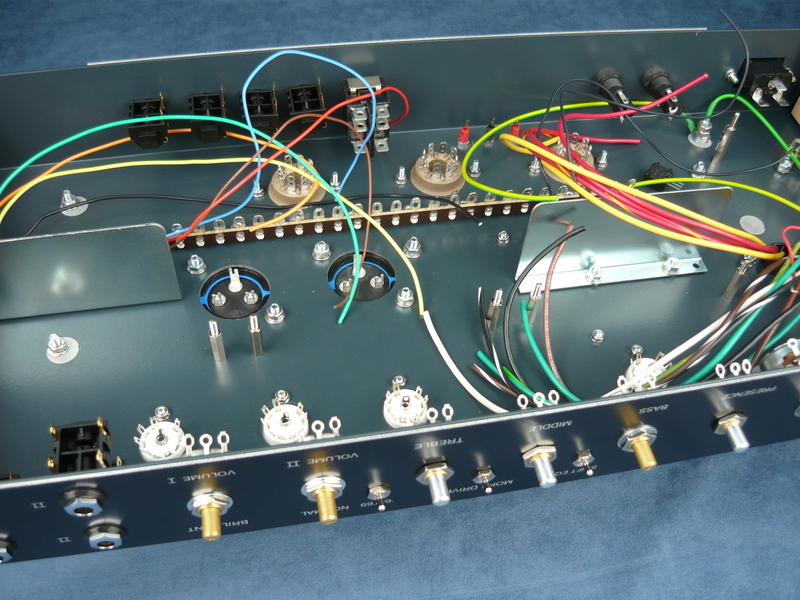 We have yet to try the new Mullard (reissue) KT88’s. 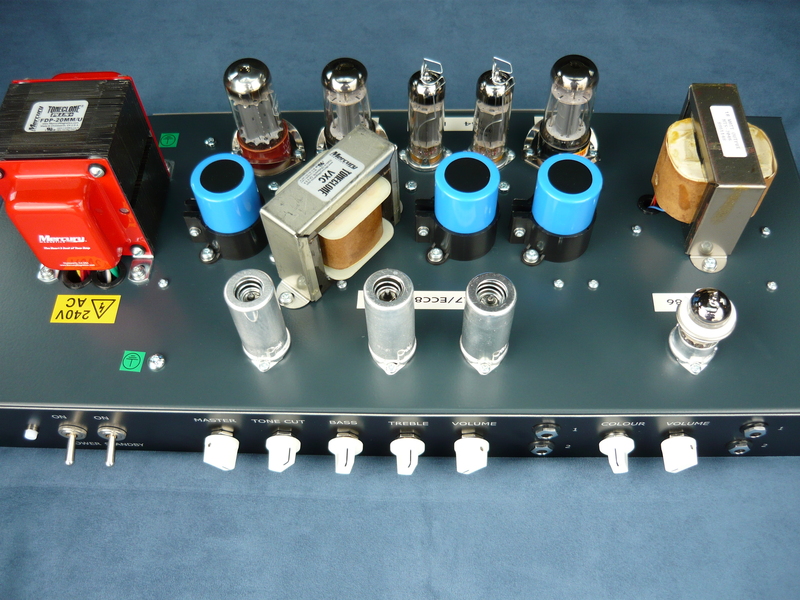 In this first amp chassis we have employed a pair of Gold Lion 12AX7’s in the preamp, as well as the single KT88 output valve. The combination is stunning. Well, moving on folks: the ‘se’ in KT88se obviously stands for ‘single-ended’. 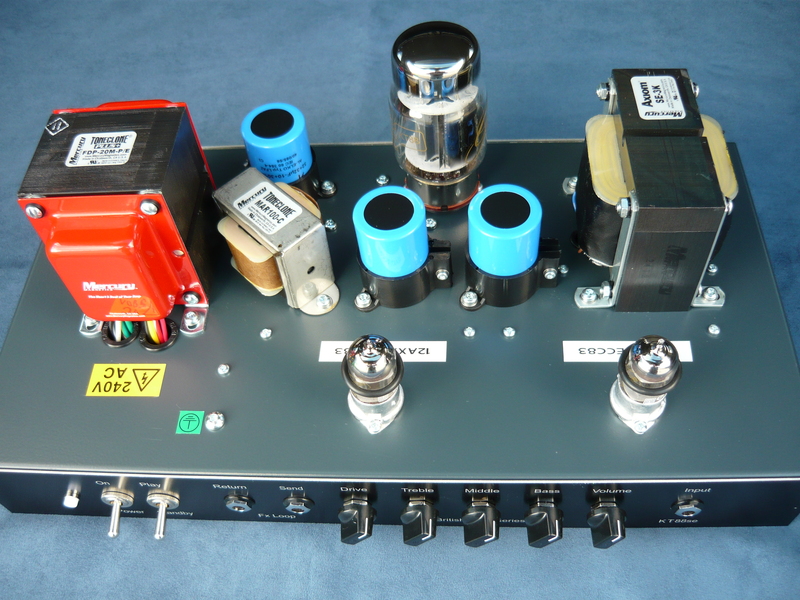 Rather than a ‘push-pull’ power amplifier configuration (the most common arrangement in valve guitar amps), utilising a pair or multiple pairs of output valves for greatest efficiency, in this configuration we utilise a single power valve, driving a very substantial output transformer specifically designed for this application, and biased to operate in pure ‘Class-A’ mode. By employing the KT88 valve, we can achieve an audio output of 15 watts with suitable transformers – ample power to achieve good results with our favourite vintage style guitar speakers. 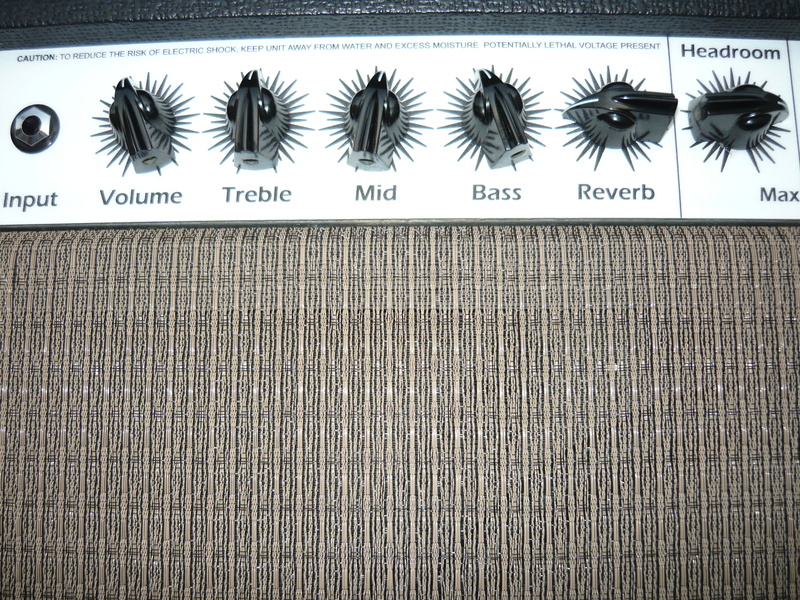 By comparison, most single-ended guitar amp models, whether commercial or boutique, actually only deliver about 4 watts maximum employing a single EL84 or 6V6, with limited bandwidth, regardless of any marketing claims. 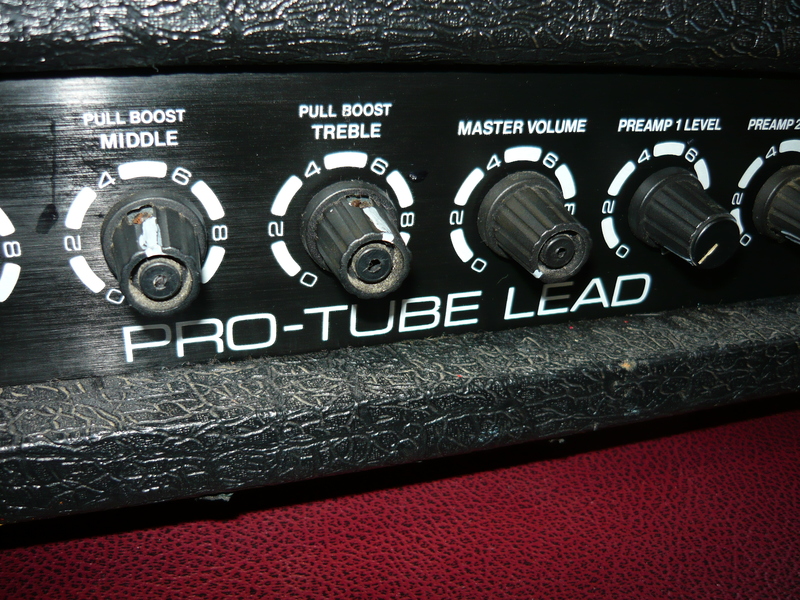 The ‘single-ended’ output stage results in a unique tone, compared to the ‘push-pull’ output stage. Whether one is ‘better’ than the other is purely a question of personal taste, of course. 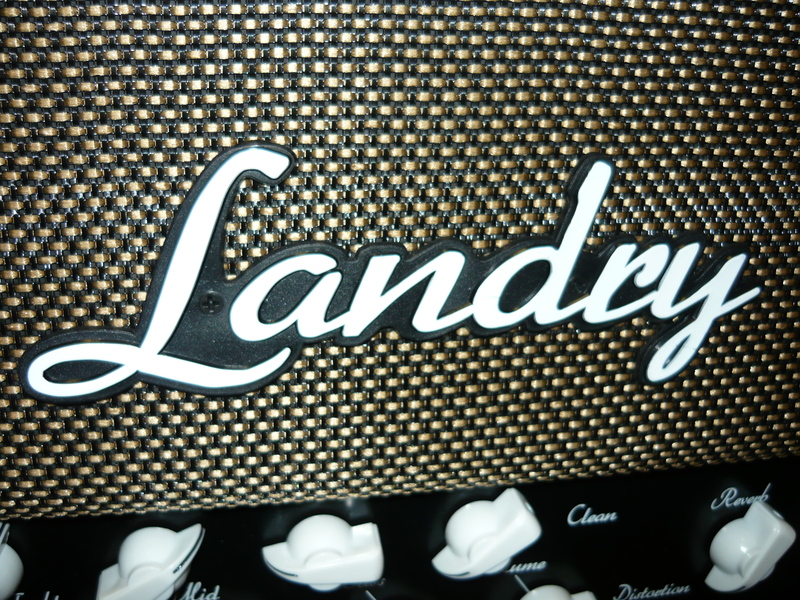 For the guitarist, the ‘single-ended’ amp does not cancel out even order harmonics, so the resulting sound is very rich in the 2nd, 4th and so on harmonics, which are more pleasing to the ear than odd order harmonics, and are heard as a warmer, fatter and more complex tone. The asymmetrical clipping on overloads further emphasises even order harmonics. Power supply hum is rejected with additional filtering, and the inclusion of a filter choke capable of carrying the full high voltage current draw of the amplifier, “upstream” from the output transformer. The KT88se has full guitar preamp functionality with a single high impedance input jack, preamp volume control, three 12AX7 gain stages, three band ‘British’ passive EQ, a buffered FX Loop driven by the spare 1/2 12AX7 stage, metal power and standby switches with power ON indicator. 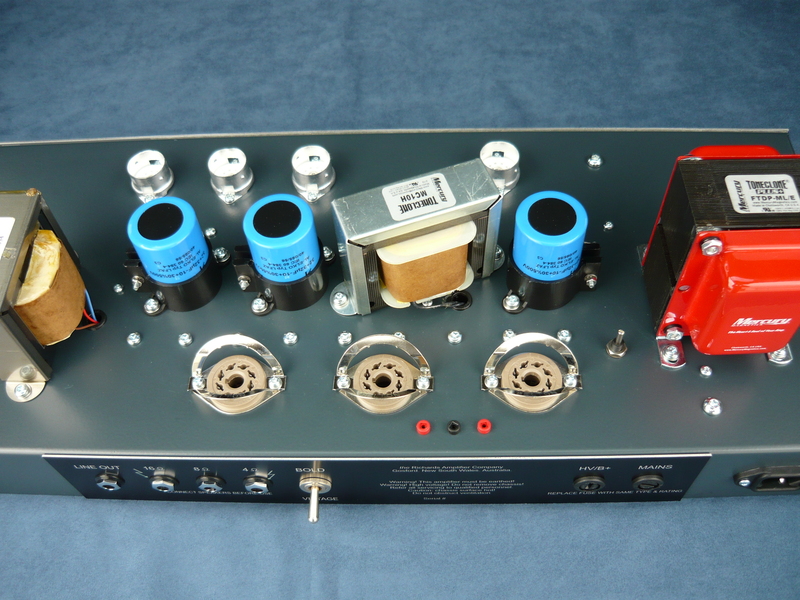 We are also offering the same amp without the FX Loop for those who require the purest possible signal path. 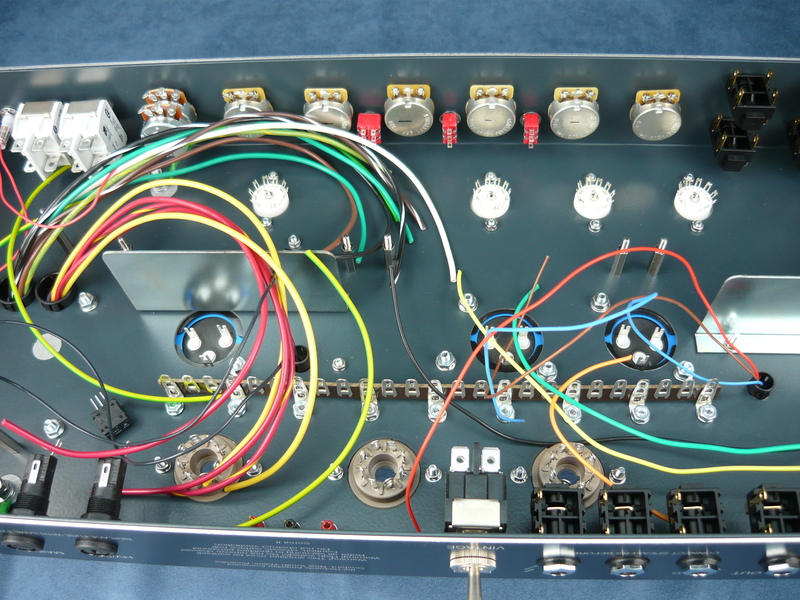 Completing the front panel functionality is the unique Drive control, which operates in the power amp circuitry and adjusts the global amp gain or sensitivity by increasing or reducing/bypassing the effectiveness of the global negative feedback loop. 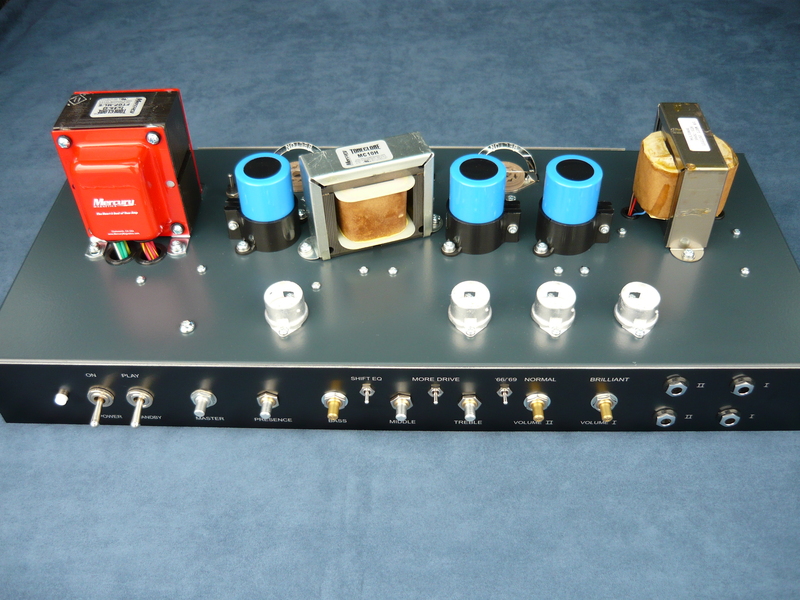 The rear panel also offers full functionality with mains and HV (high voltage) supply fuses, power output jacks for 4, 8 and 16 ohm speaker systems, and a line-level signal output jack. The Bold/Vintage switch reduces power output from 15 watts to 6 watts in ‘Vintage’ mode. 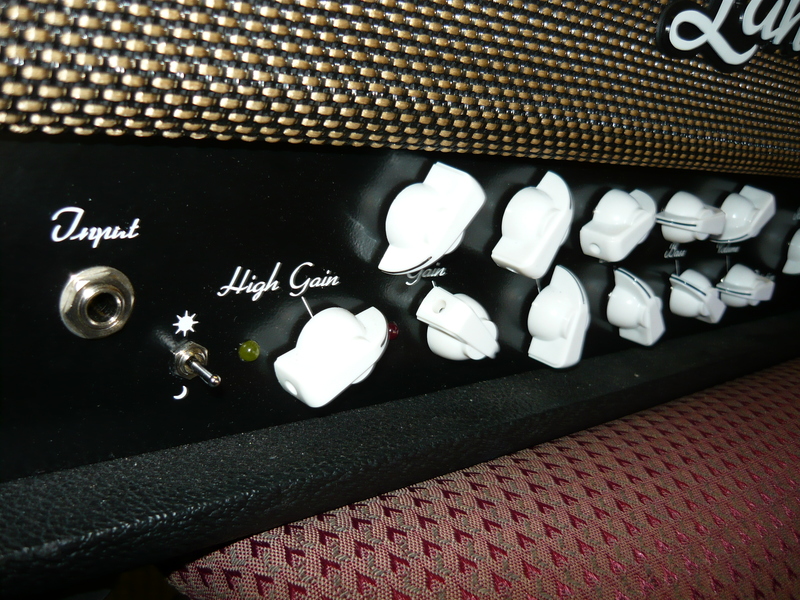 Our amp launch held at the Rock God Music School (Wyoming NSW) revealed the completed amp design exceeded all expectations and delivered a monstrous tone. In our next blog, we will publish Chris Earle’s testimonial/review of the KT88se.